Asterling display from the Windies’ fast bowlers helped the home side seal a staggering ten-wicket win over England in Antigua, wrapping up a series win with a match to spare. 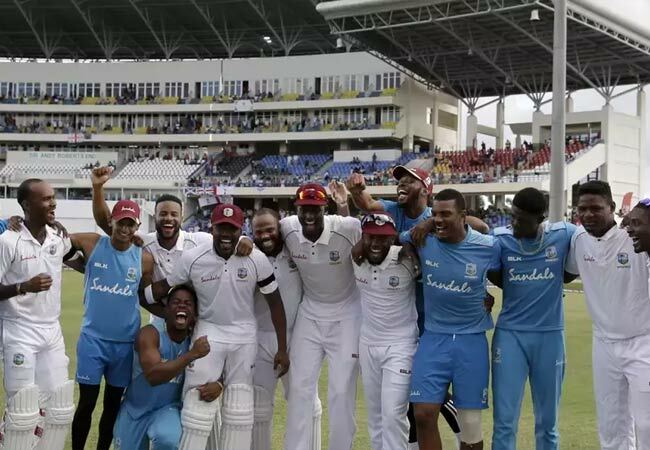 Captain Jason Holder and Kemar Roach starred with four wickets each as England were bowled out in disappointing fashion once again, amassing just 132 as the Windies were set a meagre 14 to win and claim the Wisden Trophy. The day began with the Windies looking to extend their 85-run lead with Darren Bravo and Jason Holder at the crease. Holder, who ran England’s bowlers into the ground with his double-century in the first Test, added just three runs to his overnight score of 19, as James Anderson found the all-rounder’s outside-edge, Jonny Bairstow taking the catch behind the stumps. Kemar Roach (6) also departed to the veteran seamer, while Alzarri Joseph (7) was to be Ben Stokes’ second wicket of the innings. At the other end, Darren Bravo continued his grinding effort from the second day, eventually reaching 50 from 215 balls, the slowest Test half-century by a Windies batsman in terms of minutes. Bravo departed from his next ball faced, stumped by Bairstow off the bowling of Moeen Ali to end the Windies innings on 306. England’s opening pair of Joe Denly and Rory Burns survived till lunch, with the visitors 9/0, trailing the Windies by 110 runs. A breakthrough would come through the arrival of Holder’s bowling, as the left-handed Burns’ (16) attempt at a cut saw him guide the ball into the hands of John Campbell in the slip cordon. Bairstow (14) was to be Holder’s second victim, an attempt at a full-blooded drive saw his stumps cleared up. Joseph, bowling from the other end, backed up his captain’s excellence, and showed incredible mental resilience after it was announced at the start of the day that his mother had passed away overnight. The young fast bowler removed both Joe Root (7) and Joe Denly (17), leaving England on 75/4 after the end of the second session. Denly’s dismissal was particularly eye-catching, the Test debutant shouldering his arms to a delivery that sent his off stump cartwheeling. Any prospect of a recovery in the evening was halted by a sensational spell from Roach. The Bajan quick was fast and accurate, removing Stokes (11), Moeen (4) and Foakes (13) in quick succession. While Jos Buttler (24) seemed to be finding some rhythm with the bat, unfurling a couple of strong drives for four, he fell victim to Holder, who got the ball to straighten and hit the batsman’s pads in front of the stumps. Stuart Broad and Anderson fell not long after for ducks, with England carving out just a 13-run lead. It was comfortable work for Campbell (11*) and Kraigg Brathwaite (5*), the Windies openers, as the small target was run down in just 2.1 overs. Roach, who finished with match-figures of 8/82, was named Player of the Match, as the Windies regained the Wisden Trophy for the first time since 2009.